See "blunders". See also here for OKN calibration error. The eyes and the rotatory chair velocity are calibrated independently. Independent things can be mismatched. When there is a mismatch, there can be a peculiar pattern where mid-frequency VOR gain is too high. No human being can produce r-chair gain of 0.9 at 0.02 hz. Note that the phase is normal. This means that there is a gain error, but timing is normal. If the phase were 0 degree at all frequencies, this could mean that there was instead a light leak. This is the rotatory chair test done with the calibration array closer to the head than configured in the software. This causes the eye to move more than it should for a given displacement of the chair. It is puzzling to us that the eye velocity does not exceed chair velocity. Now the gain is low-normal, and phase is unchanged. VVOR better than perfect, VOR gain trajectory very implausible. 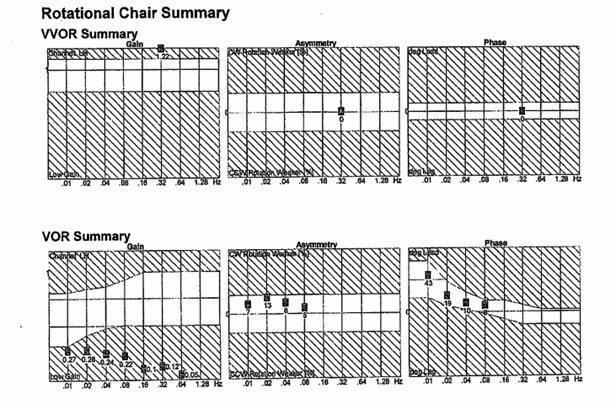 Below is a rotatory chair test (from another institution but using the same micromedical chair), showing two different problems. The VVOR gain is 1.22. This means that the calibration was wrong, as VVOR cannot be > 1 for obvious reasons. Also note that the VOR gain DECREASES with chair speed. This is probably poor instruction, but could also be a technical issue. This illustrates why it is a good idea to test your equipment out on normal people.